We are in the middle of an ‘energy transition’ — one which is focused on the decentralization of energy and the rise of energy technology like microgrids. A new report from Schneider Electric, “How Microgrids Contribute to the Energy Transition,” highlights how over the past century or so, we have come from making huge progress in the centralization of electricity production to today — when instead, decentralization could ultimately help tackle the energy challenges of the 21st century. One reason for the shift to exploration in decentralization methods is the expected increase in electrical energy demand globally. Along with this spike in need, businesses and societies are also looking to cut down on CO2 emissions, and ramp up resiliency. Enter the microgrid. These factors and more are driving what Schneider calls a “new energy ecosystem” — also known as microgrids. They are efficient and allow for “smarter” control, which makes them ideal for this shift in focus for the energy industry. Energy industry predictions include an increase in electrical energy demand, improved access to energy globally, and the reduction of CO2 emissions and fossil fuel energy. Of utmost importance to microgrid proponents is energy reliability. The microgrids’ propensity for resiliency is provided through its ability to island itself from the main grid and be self sufficient. And what about if the risk is predictable, such as a change in the weather? 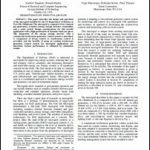 Microgrids can be prepared by intentionally adopting a precautionary strategy. Ultimately, microgrids are see as the emerging energy ecosystem that provides practical answers through a local, interconnected energy system within clearly defined electrical boundaries, according to Schneider. These energy systems incorporate loads, decentralized energy resources, batter storage, and control capabilities. With some of the predicted changes in the energy environment already coming to fruition — such as a boom in demand — it seems microgrids will soon have a front and center role in the transitions ahead. 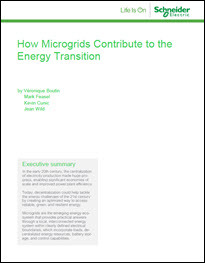 Download the full white paper from Schneider Electric,“Microgrids Contribute to the Energy Transition,” that explores how microgrids are contributing to the energy transition and a focus on decentralization.